Unlike dogs, guinea pigs don't come in various sizes like toy, standard and giant. All breeds of guinea pigs weigh around 2 pounds and range between 8 and 12 inches long. 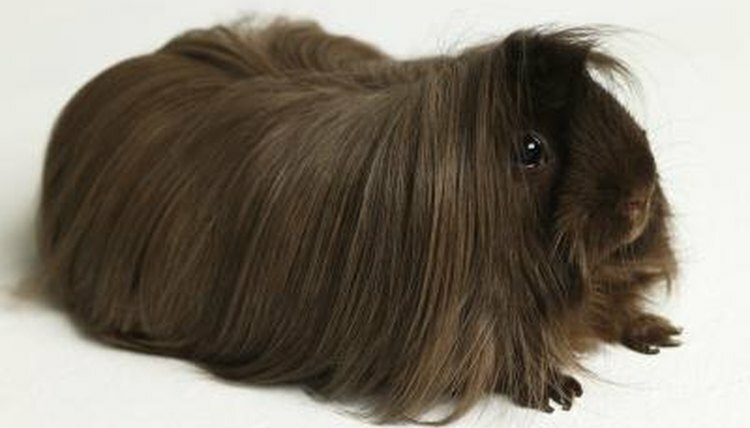 If you like long hair and have time to groom, the Peruvian guinea pig is one for you to consider. Guinea pigs (Caviidae porcellus) are neither pigs nor from New Guinea. The rodents come from South America and their gentle nature makes them good introductory pets for children. The American Cavy Breeders Association recognizes 13 breeds of guinea pigs. The Peruvian is one of the long-haired breeds. Other types include short-haired, straight-haired and "swirled" coats. The all come in a variety of colors. The Peruvian guinea pig or cavy has the longest hair of the guinea pig breeds, so if you choose a Peruvian, be ready to spend some time grooming. His long locks can grow several inches long, dragging the ground, requiring daily maintenance to keep it from matting. Fur colors for this guy include cream, red, black, white, and tortoiseshell and white. The Peruvian isn't the only long-haired cavy; the silky, coronet and texel guinea pigs all have long coats. The silky or sheltie is a handsome guy, with a long mane of hair sweeping back from his forehead. His hair grows fast -- about an inch in a month -- so it's especially important to keep up with his grooming. The coronet's long hair is long and soft, topped by a crest on top of his head. The long hair and crest are the giveaways that this fellow is a cross between silky and coronet guinea pigs. The texel doesn't sport the straight hair of the other long-haired cavies. Instead, his coat is filled with long, silky ringlets, covering his entire body -- including his belly. A regular comb or brush won't work for this little one; he needs finger-combing to prevent his curls from becoming stretched and ruined. The Abyssinian guinea pig sports whirls of fur all over his body, forming the appearance of tall "rosettes" or cowlicks on his body. Each of these cavies has eight to 10 rosettes. They come in a variety of colors. The Teddy has a short, dense coat made of kinked hairs. The bent hairs are resilient, springing back up after being touched. Both the American and white crested guinea pigs have short, smooth coats, though the white crested cavy has a single white rosette on top of his head. Satin versions of the Peruvian, American, Abyssinian, silky and Teddy guinea pigs exist. Their coats are particularly soft and silky, taking on a satiny sheen. What Is a Good Starter Hamster?